We asked readers of the BBC News website to tell us about their day at a Live 8 concert. 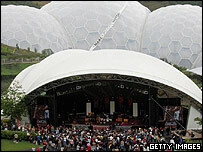 Helen Karniewicz, 15, convinced her mum to accompany her to the Eden Project in Cornwall, UK for the 'Africa Calling' Live 8 concert. A child soldier from Sudan called Emmanuel told us his harrowing story. He spoke about his capture and what they made him do. It was very emotional. Then he performed some great hip-hop. He got everyone pumping their arms and dancing. The crowd was great. It was like a carnival. Everyone was happy and making friends. The Eden Project looked fantastic, especially at night. It was all lit up so it looked magical. There was so much room to move. In comparison to Hyde Park the crowd was tiny (but it never felt that way). It allowed people to move more freely and we weren't all squashed together. The traditional music was brilliant. I think I enjoyed that the most. The singers had drums, wore brightly coloured costumes and performed traditional dance. I had never really seen anything like that before and it was amazing. I'm definitely going to go out, learn more about African music and buy some cds. The political issues were underlined by people introducing the acts. Angelina Jolie and Peter Gabriel talked about the Make Poverty History campaign. This served as a reminder to why we were there. Africa Calling was really good because it celebrated African culture. As Live 8 is raising awareness of African issues it is only right that the arts from that continent be celebrated. I think that there had been enough talking about poverty and cancelling the debt. Now something needs to be done. These concerts should make a difference as it highlights how many people care about the terrible poverty in Africa. I hope in 10 years time my generation do not have to talk about ending poverty. We won't have to if we grab this opportunity to end the suffering.